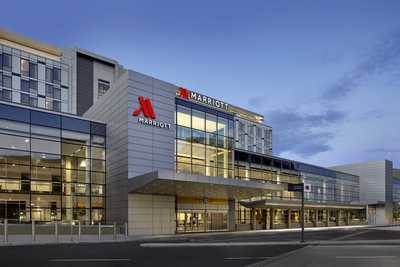 Offering the modern traveler a perfect blend of urban sophistication and convenience, Calgary Airport Marriott In-Terminal Hotel has stylishly designed rooms and a location that is just steps from the airport gates. 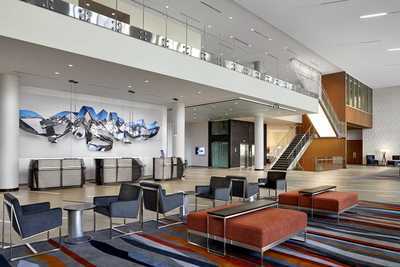 Situated between the international and domestic terminals inside Calgary International (YYC), our hotel allows you to travel with ease. Rooms are sleek and spacious, a quiet retreat with deluxe bedding, Wi-Fi and flat-screen TVs. Floor-to-ceiling windows overlook the cityscape and Canadian Rocky Mountains; some also have views of the runways. Our Calgary Airport hotel is dog-friendly and boasts amenities such as a pool and fitness center. Downtown is a short drive away so you can easily get to top sights like Calgary Zoo and major events like the Calgary Stampede. Plan a day trip to Banff or shop at CrossIron Mills outlets. Dine at our restaurant Yakima or plan your next event with us. With 18,350 square feet of venue space, we are a premier destination for meetings and weddings.